I'm back from my summer in San Diego, two months working for Modern Times. Came back to my old desk and 6,900 emails earlier today at my real job. For the last few weeks in California I was having so much fun that I stopped posting on the blog, sorry about that. While I was out there I detailed a brew day on the brewery's "main" system. So to follow up on that, I thought I'd give an overview of what day-to-day life is like at a startup craft brewery when you aren't brewing. I think many homebrewers don't have a clear image of what goes into working at a new craft brewery. A few years ago a brewer, although I can't remember who, told me that far from being a glamorous job, brewers are glorified janitors. After working at a brewery, I wouldn't dispute that characterization. 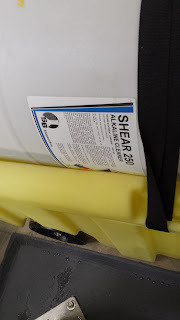 There is of course cleaning the mash tun, fermentors, kegs (using a three keg washer), the random mess that comes from boxes constantly arriving (full of stuff from McMaster-Carr, brewery schwag, hops, microbes etc. ), not to mention the floors. Sure there are days when the brewers get announced and a round of applause when they walk into Toronado, but that isn't most days. 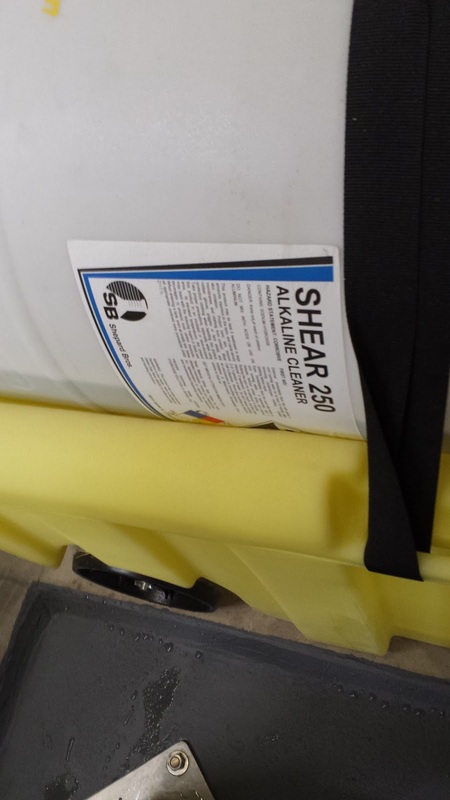 Caustic (Shear 250) - Strongly base (the opposite of acid). Caustic is probably the most dangerous thing in a brewery to human skin (as anyone who has seen Fight Club is likely aware). This makes sense as organic compounds (like yeast residue) are the prime target of caustic. If you do get caustic on your skin, quick action and rinsing with something acidic (like beer) are essential. Its effectiveness increases as the water temperature rises, to a point (around 140 F was what Alex suggested). The caustic laced (2-4%) hot water is run in a CIP (clean in place) loop that sprays the kettle, mash tun, or fermentor. When cleaning is complete on one vessel, the caustic can be pumped over to another and reused. After rinsing with hot water, the pH of the tail-end of the final rinse is checked to ensure it is equal to that of tap water, ensuring that all traces of caustic have been removed (caustic tends to float). 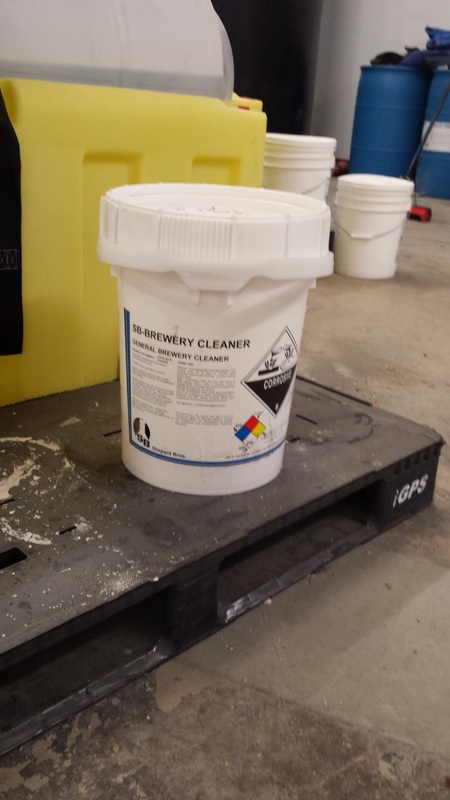 Oxidizer (SB Brewery Cleaner) - Similar to the PBW (or OxiClean Free) that many homebrewers use. An oxidizer helps to boost the action of caustic, although it could be used on its own. Used where there are especially nasty deposits that even caustic would have trouble removing without assistance. 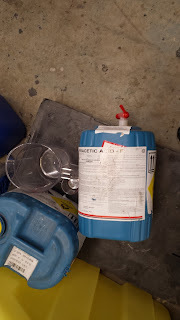 Phosphoric/Nitric Acid (Acid #14) - Diluted with cold water, this acid blend helps to remove inorganic calcium oxalate, commonly called beerstone. The low pH shines the stainless steel while removing places for unwanted microbes to hide. When dumping spent chemicals it is important to remember that bleach plus acid releases chlorine gas (which killed many people during the trench warfare of the first World War). 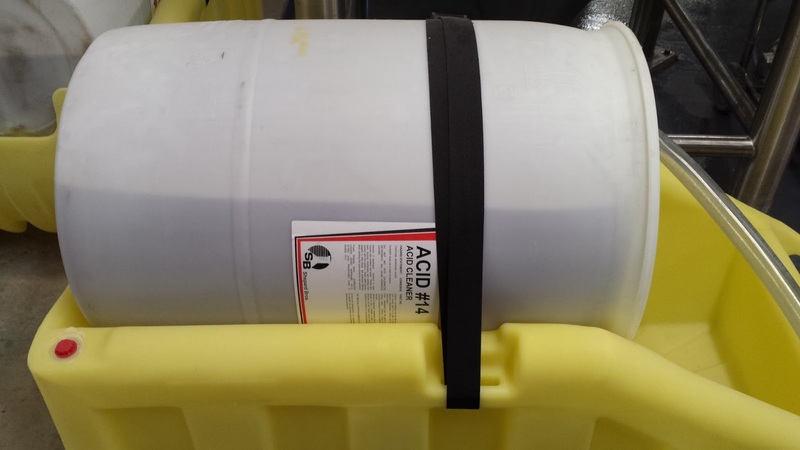 Peracetic Acid - The no-rinse sanitizer of choice for fermentors at Modern Times. It takes a surprisingly small amount mixed with cold water to effective kill microbes. When exposed to water or the atmosphere, peracetic acid breaks down into acetic acid (aka vinegar). Luckily such a small amount is not a concern for the flavor of the beer. Like homebrewing, sanitizer is not used on surfaces that contact wort prior to chilling. Surfaces that touch boiling or near-boiling wort are not a contamination risk. Remember to always dump any sanitizer that might be trapped in the racking arm of a fermentor before pumping the beer or yeast in. Unlike homebrew-sized fermentors, you can't really look into the sanitized conical or shake it to ensure it is empty. Iodophor - I tended to use this for Corny kegs, carboys, and accessories on the Pilot system. It is relatively skin safe, so I tended to use it anytime I'd have to touch the sanitizer. It was also kept in spray bottles to sanitize sample ports, gaskets, clamps, and the tops of filled Sanke kegs. Heat - As I mentioned in the brew-day post, water from the hot liquor tank is often used to pasteurize hoses and smaller vessels (e.g., yeast brink). Heat has the benefit of killing microbes down in small cracks and crevices where it is impossible to guarantee sanitizer would reach. If you are coming onto an established brewery that does several brews a day (our head brewer was overseeing more than 40 batches a week when he left Lost Coast), your experience of day-to-day life will be quite different from mine. When I left, there were only a couple big batches brewed each week. With sales steadily growing, the tasting room now open, and canning starting in the next couple weeks, brewing will become more frequent. In addition to cleaning, most of my days were spent brewing 20 gallon batches on the pilot system (I'll walk you though one of those next week), helping to build out and paint the brewery, getting microbes started for the barrel program (30 wine barrels are arriving shortly), writing, organizing, and other miscellaneous projects. Luckily I was spared the sales work that the other brewers are doing, visiting local bars to give samples, working with our sales reps, and working the tasting room. The brewers also spend time monitoring fermentations, carbonating beers, filling out kegs, working on paperwork for taxes, ordering ingredients/equipment etc. Drinking and evaluating our beers was an important part of all our jobs, but not huge time-wise. Boots - The single most essential item for any brewer. Everyone has their own tastes, but footwear need to be water- and chemical-proof at a minimum. You need protection from the near boiling liquids and caustic/acid that flow (sometimes unexpectedly) across the floor. Mine are 6" laceups, which served me well (and quite reasonable at about $30). Alex preferred tall slip-on rubber boots, while Matt wore low slip-on leather boots (when he wasn't walking around in flip-flops, the California brewer look as he called it). Socks - Up through college I wore tube socks. I never really liked them (they tended to end up bunched around my ankles), but it's what my mother bought and I didn't realize there were options. Since then I've become a convert to shorter socks. Turns out they are an unsurprisingly poor pairing with over-the-ankle boots. After a couple days I bought socks tall enough to prevent the boots from rubbing against my calves. You'll be standing and walking around a lot, so the more comfortable your feet are, the better. Gloves - The brewery has a couple pairs of chemical resistant gloves floating around for measuring out the dangerous cleaning products. You need a combination of safety and dexterity, gloves aren't much help if they protect your skin, but prevent you from moving dangerous liquids carefully. Some brewers also have more maneuverable gloves to make handling scalding hot hoses easier. Safety Glasses - Always good to have some eye protection when working with dangerous chemicals. It only takes a single drop to the eye to cause serious problems (luckily the emergency eyewash station hasn't needed to be deployed yet). T-shirts - As a brewer you are generally required to wear t-shirts from the brewery, or breweries you've previously worked at, bars where your beer is served, or obscure industry-specific suppliers. Luckily you acquire these for free at a relatively brisk pace. Really dress-code depends on the place and who you interact with. I learned a lot this summer thanks to Matt, Alex, and Derek. I really appreciate the time they took to answer my questions, and help me when I had no idea what I was doing (aka most of the time). Hopefully some information on sours and Brett flowed the other way as well. I'll be writing another, more philosophical post here about what I learned, and probably some sort of wrap-up post for the Modern Times blog about what I accomplished. Despite the hazards, the experience still sounds like a blast, especially compared to a cubicle! How is Modern Times running its CIP to start? Did they buy/build a skid or are they making up solution in an FV, HLT, etc? Did they have to buy a bigger, beefier pump specifically for CIP? Will the process change as production picks up? I laughed so hard about the cleaning. That is the toughest part of working as a brewer. I still have a large lump on my leg from sliding down platform steps with wet boots 20 years ago... Caustic in the eyes and burns on various parts of my arms. What fun! I always enjoy your insight. And it was fun to have you out in San Diego for the summer. Is there a wastewater discharge neutralization step as all of these acid and base solutions go to drain? Thumbs up. 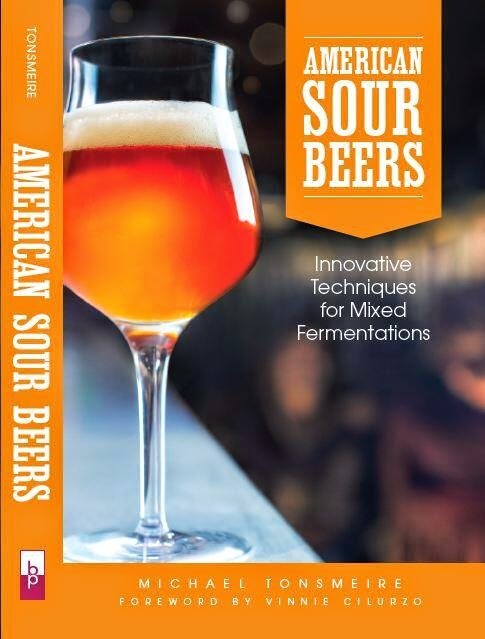 Just curious - what's the status of your sours book? Excellent post. Quick question: why do you prefer Iodophor over StarSan for kegs and pilot system stuff? I've heard the same thing about owning/running a microbrewery: "that's fine if you want to be a janitor." You've just demonstrated the truthfulness of that statement for me--thanks! I'm cured of the notion. I'll remain a happy homebrewer and search for excellence there. Not a lot of specialized equipment for cleaning at this point. The water and chemical are combined in the grant or hopback when cleaning the brewhouse. Not sure if higher horsepower pumps were purchased specifically as a result of CIP demands or not. I'm also not in the loop on long range cleaning plans. We are getting a four head cleaning pot for the tap lines and growler stations. I was just happy to survive the summer with only an achy foot, and a minor burn on my arm from bumping the pilot rig. I'm not aware of a waste water neutralization step. Both sanitizers work, I tend to use Star-San at home. At the brewery, it can cause issues by foaming in CIP applications, and pH requirements mean it is less reliable over time in spray bottles (unless it is made with distilled water). Owning a brewery is even worse than being a brewer, Jacob spends most of his time dealing with inspections, regulations, business etc. Book is still slowly edging along. Hopefully sending it off to the tech editor in the next couple weeks! I'm a part-time zookeeper at the Louisville Zoo, I think that brewing and zookeeping are basically the same. I clean most of the day and work with the animals a fraction of the time.